No that was not a typo. It is actually a Chicken cone, not the regular ice-cream cone. 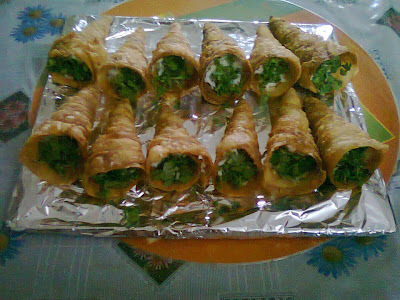 The recipe was introduced to me by my former student Aysha Yusra, who is known to come up with bright cooking ideas which are not just tasty, but also aesthetically very pleasing. 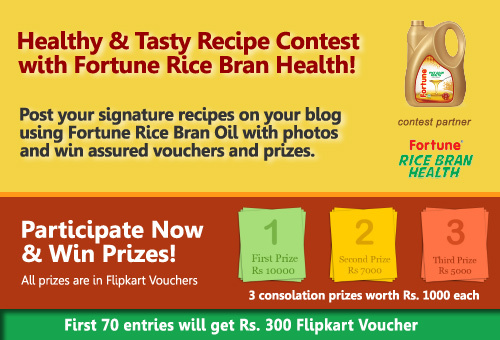 So when Blogadda asked to share recipes, I took her help in coming up with one of the tasty looking recipe, that is prepared with Fortune rice bran oil, so that you don’t compromise with your health either. Warm the water and mix the flour to form dough which is neither too soft nor hard. You should be able to roll it into a chapatti easily. Knead it well and keep it aside for 30 minutes. Divide the dough into equal portions and roll out chapattis from them. Cut the chapattis into inch long strips. Wrap them lightly across the cone moulds. Fry them one by one heated Fortune Rice Barn Oil one by one, until they turn golden brown in color. Do not overcook them, because then they become too crispy and lose the taste. Remove the moulds when you are frying the cones. Fry the onions in fortune rice bran oil, until they turn golden brown. Add tomatoes, capsicum and fry few minutes, before adding chicken, ginger garlic paste, salt, red chilies, turmeric, mint leaves and half of the coriander leaves to the mix and cook it stirring once in a while. Add boiled green peas to the chicken masala, once the chicken is tender and water evaporated. Fill the cone with the chicken masala. Top it up with grated cheese and coriander leaves. Bake it at 200°F in a preheated oven for 5 minutes. Serve hot with Chutney or sauce. I'm vegetarian but it looks really tempting.